MLS Class 4 Laser - Pain Relief and Faster Recovery! your chiropractor in New Berlin. Call us today at (262) 785-5515 ! New Berlin chiropractor Eliesha Evans, DC at Evans Chiropractic & Pain Relief Laser Clinic is one of the best chiropractors in the New Berlin area specializing in chiropractic care and wellness. Dr. Eliesha Evans is a chiropractor committed to providing pain relief for a wide variety of spinal and extra spinal problems and injuries. Dr. Eliesha Evans is committed to delivering state of the art patient centered care. At Evans Chiropractic & Pain Relief Laser Clinic, Eliesha Evans, DC understands that a team approach to patient treatment is the most successful and has successfully utilized this approach for many years. Dr. Evans, DC is committed to you helping you achieve and maintain a higher quality of life. 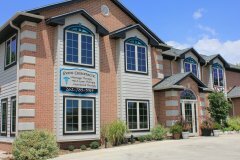 At your New Berlin chiropractic office you will receive the best care through the use of modern chiropractic techniques and technology. Dr. Eliesha Evans and the staff at Evans Chiropractic & Pain Relief Laser Clinic have a genuine concern for your well-being and health! Call us today and we can develop a chiropractic plan specific for you. If you are new to our website, please browse our site to learn about our practice and to discover the wonders of chiropractic and wellness. Click on the "email us" link below to ask us a question or to send us feedback. Use the "send to friend" link to share our health information with your friends so that you can begin a journey to wellness together! To receive free wellness and health articles subscribe to our monthly newsletter. If you are already a newsletter subscriber, please explore the member wellness section of our website for animated exercise videos, wellness articles, chiropractic resources, and health facts specifically targeted to your wellness needs and interests by Dr. Eliesha Evans. Serving the communities of New Berlin, Brookfield, Muskego, West Allis, Mukwonago, Waukesha, Milwaukee, Franklin, Greenfield, Glendale, Greendale, Oconomowoc, Pewaukee and other surrounding areas. Conveniently located off the freeway at National and Moorland Avenues. Listen to Dr. Evans as the featured chiropractic authority on Experts You Can Trust! "The phrase, "No pain, no gain" is now obsolete in my thinking. I am restored to life, and I gained it without suffering pain. After reading about Dr. Evans and her MLS Class IV laser therapy, (which did, by the way, actually relieve my knee pain without the use of braces, without any injections, or surgery) I put my faith in her and in the team at the office of Dr. Evans. Following treatments my knee pain was relived by 90%. No kidding. It worked beautifully! The other 10% can be attributed, I believe, to my old age. Due to my new found happiness, I am planning to start up a new Boy Scout Troop for Senior Citizens with this motto: "Be Repaired" by Dr. Evans. I feel lucky to have found the knowledgeable Dr. Evans and her staff at the Chiropractic, Pain Laser, and Acupuncture Center."